So. Hygge. 'What is it?' or 'please shut up about it already' are probably what you're thinking right now. Am I right? I very quickly mentioned the concept of hygge as an afterthought in my post a couple weeks ago about my 2016 wrap up and expectations for 2017, and a surprising number of people asked me what the heck I was talking about. I say surprising because I thought it was a lot more prevalent than it apparently is. Probably because of my own interests and internet searches, I was definitely feeling like the concept of hygge was being written about everywhere, and certainly more so towards the end of 2016. But for those of you who weren't and still aren't totally familiar with it, I decided I'd offer a quick post on my take on it and why I really like it, trendy or not. Let's just talk about what it is. 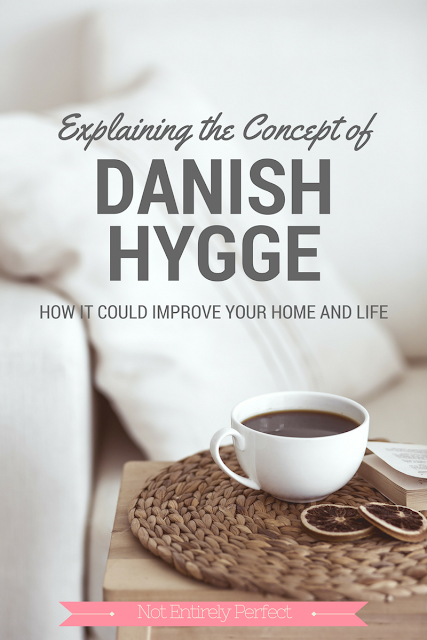 Hygge (pronounced hoo-gah) is a Danish word, and concept. It's doesn't have an easy direct translation in English, which is why it's easier to just use the Danish word. But the closest words you can kind of string together to describe the idea would be cozy, simple, homey, love, community, relaxed. Oh and food and drink seem to be a big part of it. It generally grows in popularity in winter, which the Danes have an abundance of, but it's about slowing down, staying home, making it cozy, turning off the tv and spending time with family and neighbors. It's used a verb, really - 'we're going to hygge on Friday' i.e. invite the neighbors and make mulled wine and cakes, play games by firelight and tell stories. A very, from a modern American standpoint, old school, small country town way of living. One of the reasons it's caught on it's because the Danes are regularly ranked as the happiest or one of the top 3, at least, happiest countries in the world. A lot of people are now saying that it's because of this concept of hygge, which is pretty anti-consumerism, anti-go go go stressful work week that we have here in the states. This might be true, orrrrrr it just might be the fact that the Danes take more mood altering drugs, such as Xanax, than anyone else in the world. I don't know about you, but if I had to take a survey on my happiness levels while on Xanax, I'd be a remarkably positive person too. So I'm not jumping on the bandwagon of saying 'hygge works because the Danes are happy' so much as I just like the concept as I apply it to my own life and see the positive effects. Now, I don't actually believe that people are thinking 'well this folks are happy and I want to be happy so let's try this.' I think it's a natural progression of minimalism and the decluttering journey a lot of people have gone on lately after reading the Marie Kondo book. Getting rid of things that don't bring you joy is one thing, but what's next? Particularly when you get rid of a lot of stuff and have this great minimalistic space, the mind tends to drift to what you can do next to simplify your life or at least give it more meaning than going to work and coming home to the tv, day after day. You freed some time and mental space, too, when you got rid of physical clutter, so what do you fill that with now, that will bring you more happiness than 'the stuff' did? And that's where the hygge comes in, and that's why it's growing in popularity right after a major push towards decluttering did. It's sort of simplifying of all aspects of life and embracing the important things like slowing down, spending time with family, making the most of the moment, planning for and preserving happiness; all things that I saw come up a lot on people's 2017 resolutions and bucket lists. 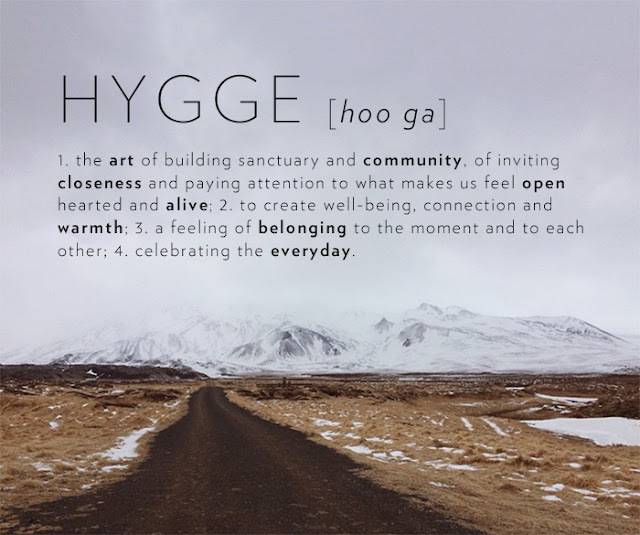 Hygge was really what I was embracing before I had a word for it, when I think about it. It's definitely about minimalism and simplifying things - I had the motivation for that part in spades, I love decluttering. After the decluttering, I really concentrated on making the space cozy, with my candles and throw blankets. Once John and I both felt like our home was a haven, a little safe and cozy corner of the world, it became about sharing that with family and friends. We got a bar cart and stocked some snacks, nothing complicated. We're ready to invite people in and host whenever someone drops by, which feels nice to me. I like the whole 'hygge home' concept, simple living and all. There are so many books on Amazon about it, if you want to know more. But maybe you don't need to know more. Maybe you already get it, and are trying it in your life this year; you just didn't have a word for it yet. Well, now you do. Hygge.